This past week has been a particularly festive one. On Wednesday, the city’s Muslims celebrated Eid, while the Hindu community was celebrating Gowri puja. Thursday was a holiday on account of Ganesh Puja. This marks the beginning of the festive season. The next few months will see a flurry of festivals and celebrations: Dasara, Durga Puja, Diwali. Earlier this week I took another trip to Pottery Town. I knew it would be particularly busy, just days before Ganesh Chaturthi. 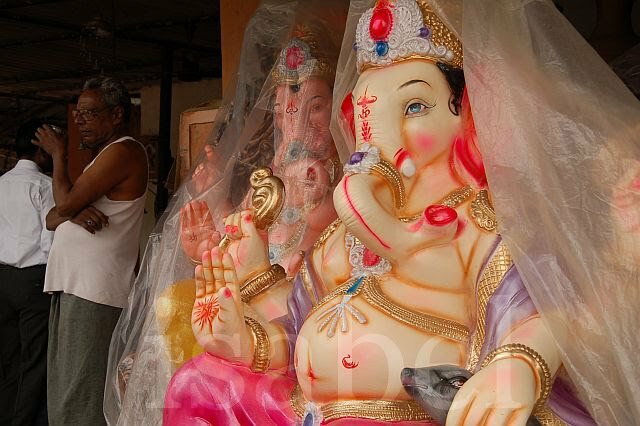 The lanes were crowded with 10-foot statues of Ganesh wrapped in plastic. Artists were busy with last-minute preparations. Trucks were being loaded with statues, with straw or newspaper used as padding to protect the fragile effigies on their way to shops. There were families shopping for a statue to take home for the puja.